To Brockley today to speak at a lunchtime meeting of the Greenwich, Lewisham and Bexley Chamber of Commerce. Lovely people and loads of interest in the work of the Career Academy Foundation. But the meeting was more noteable for its location than my speech. 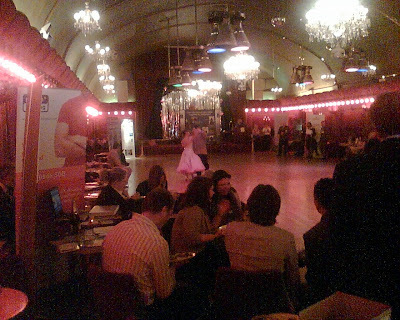 It was held at the legendary Rivoli Ballroom. Stepping out of the sun from a pretty ordinary south London street, was like stepping back in time. The doors opened up to reveal the ballroom’s glittering chandeliers, ornate fittings, long sweeping dancefloor and plush scarlet and gilt Viennese-style decor – a bit faded admittedly, but that just added to the charm of the place. The Rivoli started out as as the Crofton Park Picture Palace in July 1913. It showed silent films until the arrival of “talkies” in the late 1920s. It became a ballroom in 1957 and like many had its heyday in the 60s and 70s, when it featured performances by acts such as Acker Bilk and Pans People. In the 1980s, pop diva Tina Turner filmed the video for her hit Private Dancer at The Rivoli. Other pop luminaries of the time who filmed at The Rivoli include Elton John (They Call It The Blues) Tracey Ullman (Move Over Darling) and the Beautiful South (I Sail My Ship Alone). So I wasn’t at all surprised to discover that, after I’d spoken and we’d all enjoyed a brilliant Caribbean lunch of rice and peas, goat curry and jerk chicken, that we were to be treated to a display of ballroom dancing. I got back to the office rather later than I expected. Tripping the light fantastic takes time.